My mother moved into Brookdale Richland Hills, and as far as I can see they are good. Her room is nice, it is spacious, and clean. They have regular activities and I met the activities director. She's nice and my mom likes her. I also talked to some of the residents and they all like the activities director as well. We ate lunch and dinner there with the staff members and some of the people, and it was good. The staff is very attentive, they answered our questions, and have no problem calling me if there's a problem. They're just good people. The place is small and not over-crowded. Brookdale Richland Hills TX was nice. My visit was good, and I don’t remember anything negative. The dining area was nice, but it was a bit noisy. They are a little above my income right now. We really liked the tour of Brookdale. It was a nice facility with a good common area. We were impressed with how clean it was. My husband and I toured and were impressed by Brookdale Richland Hills (formerly Sterling House of Richland Hills). I almost preferred it because it's close to me, but they based their cost a la carte, so there's a charge for everything that you need assistance with. They had a separate memory care building. The staff was very friendly when we walked through. With the level of care that my dad needed, it was really cost prohibitive because he needs help with everything, but I would love for him to be there. Brookdale was very nice but they did not have any available space when we toured it. The staff was friendly and helpful. We did not have any issues with the staff. The dining area was nice and set up like formal dining. The apartments had pretty good size rooms. Brookdale was a smaller facility with fewer residents and not much going on. It was pretty quiet and laid back. The room was too small. The dining area was upfront when you walk in, and it was small. It did not meet our needs. I was most impressed with Brookdale Richland Hills. They were very friendly. It seemed like a very nice secure place. The staff was very friendly. It looked very clean and very happy. The residents looked happy, and the ones that I talked to were very happy there. What I like about them was that a doctor would come and visit my mother there, so she wouldn't have to leave to go to the doctors. We didn’t like Richland Hills; it was too much like a nursing home. It didn’t have like a hotel setup, but the staff was very nice. It was nice; we just didn’t like the setup. The dining room was like a cafeteria style. Sanitation could be better. There was a smell that was a little bit strong, but that may be just the moment when we went in there. Sterling House looked prettier. The people weren't as friendly. It was a lot more expensive, and the rooms were a lot smaller. I walked through while they were eating several times, and the food looked OK.
Sterling House of Richland Hills and their mother company -- I’m not impressed with them. They're too commercialized for me. It just seemed like a very high pressure sale to me. That kind of turned me off, and I don’t like that. The person who I met there, she was fine. What I did not like about that assisted living is that they assigned seating for meals. So if you have a parent who might like to meet different people, it’s like they’re not able to at dinnertime, because they’re seating at the same seat every time. There may be people who you need to do that with, but I certainly don’t think that you need to do that with everyone. I think that they need to pay more attention maybe to the residents to see who needs that and who doesn’t. I think they do it because it’s just easier for the residents to know that that’s where they’re supposed to be. That's not appealing to me, and it’s not where I would want to place my father. That doesn’t mean that they’re not a good facility. That just means that’s not good for me. Overall, it’s an average facility. It was not a bad facility. The dining room was average, and the rooms were very small. It was clean. There wasn’t a smell, and I didn’t see any cleanliness issues. I liked Sterling House. I found the people extremely nice and very informative. The place was clean and friendly. The staff was very professional and happy to help. I thought the food was great and very tasty. The people are just very helpful. My father has been living in Sterling House since August. It was small and we liked it. We had met some of the staff members when we took a tour and we're impressed. They seemed very concerned about the residents and had their best interests at heart. It was very inviting. Sterling House was very nice, however, it was too dressed up for him and my dad was just a simple person. The staff there was very nice and helpful. The rooms were very nice, but I guess it's the amenities that made it very expensive. my father has been living here aor about 18 months. The facility is older, but, takes great care of him. They have had a bit of turn over with the higher level staff,but, the activities director and care givers have been consistent since he moved in. He is happy, healthy, and in much better health than he has been in years. We have been really happy here. Sterling House Richland is closest to us. I didn't care for the layout of the rooms. They just seem boxy. It's says 1-bedroom, but really there is not a wall that separates the bedroom. We made a reservation in advance to see the place. I would think that they would want to try get rid of some of the smell down the hallways, but I had to hold my breath. I know it's a Brookdale. Maybe they're just having a bad day. Set back and take a look!!!! What I have noticed is the staff is overworked. Few of them are really good at what they do. The others are either overworked and do not care anymore or have not had the right training before getting thrown in. I have seen one person doing the work of three because they do not staff the way they should. On weekends and mornings I would think these times are more busy and supers would think of the residents, and their staff. Seems like they dont care. Some of the higher up people also blew my mind with apperance. All though this person works in their clare bridge building behind sterling house she still should think of her apperance. looking like you rolled out of bed and came to work will give the idea that you dont care about yourself looks are you going to do the same for my family member? We WILL BE LEAVING THIS FACILITY! I have seen two ED's since Chris left and the place continues to go down. Hope this helps. Many of my friends had recommended this assisted living facility to me and were praising it quite highly, I was quite surprised that they weren't exaggerating about the property. My Grandmother was living alone for the past 10 years after her husband died and needed a friendly and engaging environment. Both of us were really pleased at how bright and cheery the staff were, a lot of the residents were very helpful as well. The caregivers have a great program for those suffering with Alzheimer's which has helped ease my Grandmothers stress greatly. Its very friendly staff and residents, high quality rooms and a great activity plan to keep the residents busy mentally. My Grandmothers personally has perked up significantly after arriving at this new home, she hopes to stay from a long time to come, this place has made a huge difference in our lives. I just love the setup of this facility. It is comfortable and has a beautiful setting, a very friendly and compassionate staff, and quality programs, which are offered to residents.The homes itself are apartment style, but also offer personal care that regular apartments would not provide. No matter the level of care you need Sterling House has you covered; whether you need help with daily activities such as getting dresses or cooking or just needing a partner in bridge, Sterling has can provide it. They have many wonderful activities for the residents and you feel a sense of community there were the residents seem to interact alot with each other as well as the care givers providing support in any way needed. You get the feeling many residents make life long friends, which is nice to see knowing many families main concern is there happiness and care they are receiving.Another wonderful program/facility they offer is the memory care facility, which is an extensive program aimed at providing care to patients with Alzheimer's and one of the few facilities in the area.I would definitely recommend Sterling House of Richland Hills to anyone looking for a loving assisted home for someone they love. This facility was very impressive. The level of care and compassion from the staff was remarkable! The residents that I met were very happy and involved in various activities. They also had a memory care facility on the same property which makes transfers easy if needed. Describe the overall population of assisted living residents at Brookdale Richland Hills. What is their average age? What are their favorite things to do? The average age of our residents is 85. They range in age from 72-100! Seniors choose to live in our community because they need more care for a chronic condition or more structure and security. Our residents’ favorite activities include card games and bingo, going out to lunch, games to keep the brain fit, and musical entertainment. What programs or activities does Brookdale Richland Hills offer to enrich residents' well-being? Our emphasis is on care, and we enrich the lives of our residents with compassionate person-centered care and programs that are created to provide each resident with optimum health and happiness. What places are near Brookdale Richland Hills or within walking distance for assisted living residents to enjoy? We are located in a residential neighborhood, next to an elementary school, churches and North Hills Medical Center. We are just a few minutes away from major highways as well. What transportation services does Brookdale Richland Hills offer to assisted living residents? We have a bus with a wheelchair/scooter lift. The bus is available for our resident’s use several days a week. What makes the chef or dining program at Brookdale Richland Hills exceptional? What kind of menu can assisted living residents expect? We serve three meals a day in our dining room, and our residents enjoy menu options including a choice of two entrees, a variety of side dishes and desserts. The menu is designed to be easy to read, and our dining team meets with the residents weekly to discuss menus and accept requests. What safety features or security measures does Brookdale Richland Hills offer to assisted living residents? Our hallways provide a clear line of vision with no back hallways or blind spots, so we can efficiently monitor our residents’ whereabouts 24 hours a day. We offer secured assisted living and secured memory care on our campus. How does Brookdale Richland Hills keep residents' families informed about their loved ones? Efficient, open communication between our nurses and our resident families is the key. Our Health and Wellness Director and her team are available 24 hours a day, 7 days a week. We provide our families with an on-call nurses phone to ensure speedy response time. What is the care staff-to-resident ratio at Brookdale Richland Hills during daytime and nighttime hours? We staff according to care needs, we utilize a unique staffing system that guarantees the perfect staff to resident ratio at all times. If Brookdale Richland Hills accepts dogs or cats, what indoor/outdoor areas can they enjoy? Yes! We love pets and have a beautiful interior courtyard that allows our 4 legged friends to run around. All of our associates are assigned mandatory courses in senior care at intervals throughout the year. What safety features or security measures does Brookdale Richland Hills provide to protect residents who wander? Secured assisted living and secured memory care. 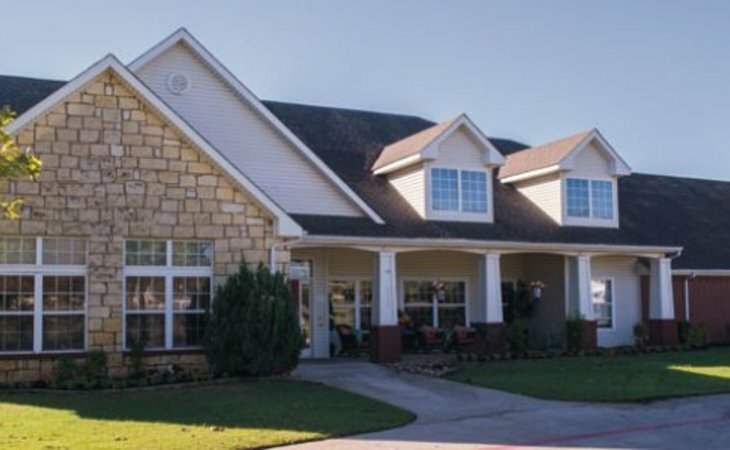 Brookdale Richland Hills provides assisted living residents with lifestyles, housing, and services in comfortable surroundings combined with exceptional amenities, programs, and care. Through Brookdale's signature Personalized Assisted Living, we customize our care offerings for the individual. This allows each resident at our community the freedom and opportunity to make choices that will ease their lifestyle transitions. Residents enjoy life with the support they need, coupled with the appropriate accommodations as their needs change. What should caregivers and potential residents know about Brookdale Richland Hills?